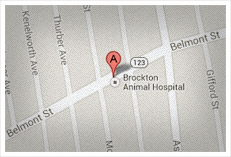 Brockton Animal Hospital’s staff is compassionate and skilled, attentive to you and your pets’ needs. Dr. Hirschberg is the hospital director of Brockton Animal Hospital. He came to the hospital after graduating from The Ohio State University College of Veterinary Medicine, and has been here over 30 years. During his tenure, Dr. Hirschberg has developed the facility into a full service hospital emphasizing surgery as well as medicine. Dr. Hirschberg’s areas of interest include orthopedics, ophthalmology, dermatology, and low level laser therapy. He is a recognized authority on photomedicine and its application in companion animal medicine. 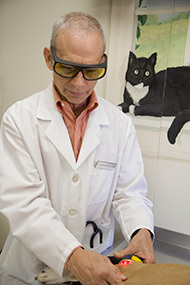 His treatment protocols are published in Thor Photomedicine’s veterinary treatment manual, and his speaking engagements have included WALT (World Association of Laser Therapy) and NAALT (North American Association of Laser Therapy). Outside the hospital Dr. Hirschberg enjoys sailing, rock climbing and tinkering with sports cars. Dr. Huffenus has been a member of the medical team at Brockton Animal Hospital for the past 14 years, first as a veterinary technician and then as veterinarian. His experience as both technician and doctor gives him an in-depth understanding of both the medical and comfort needs of his patients. 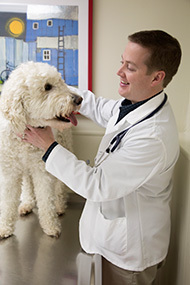 Dr. Huffenus is a graduate of Tufts University School of Veterinary Medicine. His areas of interest are cardiology, surgery and behavioral medicine. Dr. Huffenus’s diversions from the world of science and medicine include: drums, he plays many styles including African, South American and jazz; golf; running; and sailing. 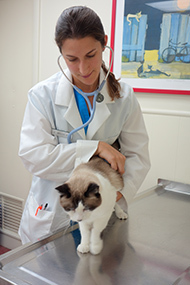 Dr. Smolka joined Brockton Animal Hospital after graduating from Tufts University School of Veterinary Medicine. While at Tufts she developed a wide range of skills through diverse experiences including: small animal medicine and surgery externships, feral cat clinics, Nestle Purina student nutritional liaison, and pet loss hotline volunteer. Dr. Smolka’s interests are in internal medicine and surgery. She enjoys feline medicine, and as a member of the American Association of Feline Practitioners, she brings the most current knowledge of cat care to the practice. Outside of veterinary medicine Dr. Smolka enjoys hiking and running, and though she no longer marches, she retains her college love of marching band.